Nice bike seat. Thank you. Item arrived in good order and as described in the listing. Thank you! It did not fit my bike but my girl loves it on her bike. Shipping was very slow. Came in a bag, metal was bent and seat is slanted now. Never got my seat even thought it says it wasdelivered. Very upset. I did not receive the item and seller is refusing to provide refund. I haven't received this package yet. Too late. Don’t buy from this seller!! Slow shipping...Item described as wide seat..read details before ordering! I can finally sit on my bike longer than an hour without pain. Cushy and wide to provide a comfortable ride. Like riding a different bike. This seat is so much more comfortable than the hard seat that came on my bike that it almost feels like I got a new bike. Most people who have reviewed it seem happy with it but there are a couple who complained that it bent or broke. To be clear this seat was built for cruising not mountain biking. 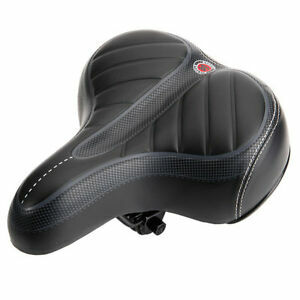 If you are using for mountain biking then you are abusing it, so if it fails don't blame the seat. Blame yourself. I use it on my stationary bike. It's far more comfortable than the seat it came with. I would have preferred a cloth seat vs vinyl and it could use a little more padding but it's a good bargain. Works much better than than the thin skinny ball breaker seat I had.